Having a new baby in the house fills you with joy, excitement — and trepidation. So as your parental instincts kick in, you want to do everything possible to keep your new arrival safe. That should include protecting him or her from sudden infant death syndrome (SIDS). According to the Centers for Disease Control and Prevention (CDC), approximately 3,600 babies die annually from sleep-related causes in the United States. That’s far too many. But it represents a tremendous drop from 25 years ago, when the American Academy of Pediatrics launched its “Back to Sleep” initiative, urging parents to put infants to sleep on their backs. For the first year, always put your baby to sleep on his or her back on a firm mattress — during naps and at night. This position makes it easier for them to breathe. “We know that babies who sleep on their backs are much less likely to die of SIDS than babies who sleep on their stomachs or sides,” she says. Once babies can turn over unassisted (typically around 6 months of age), it’s OK to let them sleep on their sides or tummies — if they move into that position on their own. Use a firm sleep surface. 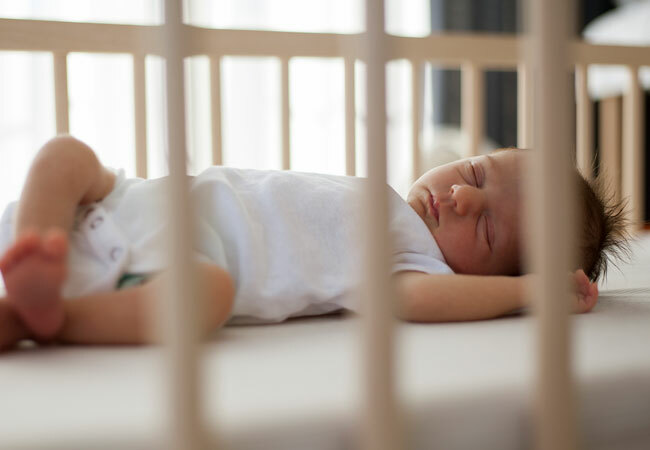 “We recommend a crib, bassinet, portable crib or play yard that meets Consumer Product Safety Commission (CPSC) standards — along with a tight-fitting, firm mattress, and a fitted sheet designed for that product,” says Dr. Rambhatla. Avoid putting anything in the crib or bassinet except your baby. Don’t use loose blankets or sheets. Soft objects (such as stuffed toys, pillows, bumpers or cushions) are also a no-no in baby’s bed. If the room is chilly, give your baby a wearable blanket (often called a sleep sack). Share a room with your baby for the first 6 months or, ideally, for the first year. Set baby’s bed up in the room where you sleep, but keep your sleeping spaces separate. It’s tempting to keep your little one in bed with you at night — but resist the temptation. Also, avoid using your baby’s car seat, stroller, swing or infant carrier as a regular sleep spot. The sitting sleep position can block your little one’s airway. If you can, breastfeed your child for at least six months to a year. Research now shows that breastfeeding can reduce SIDS risk by up to 50 percent. Try to breastfeed exclusively; but if you need to introduce formula, no worries. Not all moms are able to breastfeed. Try to avoid smoking during pregnancy and in your home after your little one’s birth. According to the CDC, many babies who die from SIDS have higher levels of nicotine in their lungs — as well as cotinine, a biological marker indicating exposure to secondhand smoke. Yes, you need to keep your little one warm, but not too warm. A good rule of thumb is to dress your baby in one layer more than you’re wearing. “If babies are sweating, or if their chests are hot to the touch, they’re overdressed,” says Dr. Rambhatla. Using a pacifier seems to offer some protection from SIDS. But you don’t have to force your baby to use one. And it’s OK if it falls out during sleep. If your baby was a preemie, the risk of SIDS is three times higher, so it’s even more critical to follow these tips, Dr. Rambhatla says.